Billy Collins writes as if he's a tourist in his own reality, a walker in his town discovering and re-noticing the things and details of a community he has strolled through countless times, on countless days. He presents in ideas in tidy frames , discussing their parts with low doses of irony, a splash of erudition, and then reassembling his subject so that that it pretty much resembles what it looked like before, if slightly reconfigured. This amounts to rearranging the same furniture in the same room much of the time, which means the element of surprise is no longer possible. His poetry is graceful and amazingly approachable in its best form, but soon becomes formula .The reader, desiring a variation something (much) darker or more difficult than the handy menu of resolutions that are Collins' stock in trade, finds it harder to distinguish the poet from a writer of light and limited amusements. His books are more interesting if you consider them the way you would a new season of a favorite television drama; whole new episodes that amount to new paint jobs on old story lines. This would allow you reap much more praise on Collins without the queasy qualifiers that attend an honest appraisal of the work. He's writing the same old scenarios with absolute brilliance!! "The Quaintness of the Past" is typical Billy Collins, the narrator, at home, reading a magazine in which he happens across a photograph that gets his attention and draws him in, an image of an old road house with a Plymouth parked in front. Where another poet would have done their best to merge with the contents of the photo and attempt a reconstruction of the lives, details and tone of the period with a vivid and often strained re imagining of a time they did not know first hand, Collins plays what is often his best card, the observer who wants to assemble his own version of the quaint image that caught his eye. He admits up front that he thinks for a moment of contriving his own memorable image, taking a snapshot of some random place in his neighborhood, perhaps the ideally described cafe near his home where he has coffee, a pastry and admires the French girls behind the corner, and then reappearing on this scene a hundred years later to experience how quaint and picaresque one's old time can appear, given enough distance. The point Collins is getting at, not so subtly and in the plainest, least compelling language he can muster, is that our imaginations arrive on the scene before our eyes do. Instead of offering up a real image of things and places from another era and giving us view of how life actually was, the narrative forms we've learned get the better of us and compel us instead to view the images as perfect arrangements of a sort, a world of harmony and natural order. Collins undermines this view and bluntly informs us bluntly that the perfect arrangements and harmony are constructions based on our collective desire to believe that there was a better life in less complicated times. This habit is a generational yearning that gets pushed on to each succeeding generation, and he asserts that there will observers of future images from our time who will wish they had lived in the early 21st century, before the fall from grace. There is a collective habit to distance ourselves from the past so that we might be able to construct an idea of a social perfection where the conflicts of our time melt away once we come to our senses. I think it less about the evasion of our own deaths (although that is an implicit idea in the poem) than it is in the willing creation of various kinds of Heavens on Earth; what Collins does is step back from the encroaching nostalgia and sees himself inventing his own narrative and thinking how he'd go about fabricating his evidence that what religion regards as reserved only for the after life--peace,harmony, serenity--is achievable while on earth. It is , of course, the problem with photography as a medium, discussed persuasively by Susan Sontag in her essay "On Photography"--that because the photograph seems to arrange it's accurate images of real things in well balanced frames that suggest a natural set of relationships between the people and things in the image--forgetting, as often as not, the photographer's skill at manipulating what he or she is making a record of--there is a habit of mistaking the scenes as being free of editorial intervention. From a distance of years, decades, the relationships seem without stress, conflict, and that becomes the mythologized Usable Past with which diverse populations--average citizens, politicians on the left and right, captains of industry, philosophers and poets-- use to make sense of the current period. 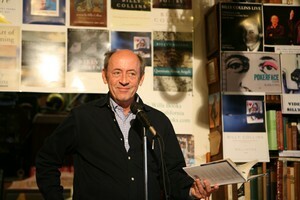 Collins , of course, cannot let his point stand by itself and supplies us with a Twilight Zone -like coda in the last verse, instructing his readers that this habit will go on long after our long speculations have turned to dust A large part of why Billy Collins has such a large readership is that besides from being superficially clever, he provides, often, a moral of the story, something that puts him more in league with Rod Serling than the company of other poets. No offense to Serling or the Twilight Zone, a series I revere, but Collins' points, his lessons, his morals are obvious and smug, elements he is often able to disguise with a judicious application of deflecting wit.His insight is that our plans seldom work out for us, but we continue our practices despite evidence to the contrary, the lesson being that a utopia that exists between our ears is better than no utopia at all. One senses Collins bemusement and comes away from his books feeling patronized. Here, though, his usually persuasive artifice can't make this poem seem anything more than a simple set up for a punchline, a clever ending. You've read this poem before you've actually scanned the first line; you know exactly what he's going to do with it.